On Tuesday night, the Pismo Beach City Council unanimously voted to ban traditional urinals. All urinals in the city that use water must be retrofitted to flushless versions by Feb. 14, 2016, according to the ordinance introduced Tuesday. The ordinance applies to public and private property. Urinals installed at new developments would also have to be flushless types. Current city policy allows property owners who retrofit urinals to receive a rebate. The council voted Tuesday to eliminate the urinal rebate program. The urinal ordinance is part of a larger city effort to conserve water. 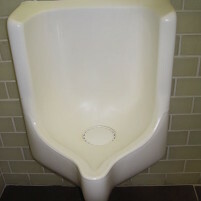 A standard urinal uses approximately 40,000 gallons of water a year, City Engineer Ben Fine said. Waterless urinals use gravity to drain urine. They also use a lower density liquid, often some form of oil, to prevent odors. The council will vote on final approval of the ordinance at its next meeting. They continue to issue new hook-ups and want us to pee on a tree. Why not just put a big potted plant in there? Hypocrites! You approve hotels with no thoughts about water usage. You table a motion to put a moratorium on building. Yet urinals are your chief concern? This pisses me off! Next we won’t be able to wash our hands in public either being forced to utilize the alcohol based hand sanitizers. This is getting pretty ridiculous. LOOK WEST! There are billions of gallons of water!!!!!! We have been too short sighted to build desalination plants. Now is the time for that to change. We need to activate the ones that work and build more. Don’t forget to intall these in the ladies room too! These days many can pull up their skirts and do their part in water conservation. When people start fighting back and I dont mean by diplomacy or voting either. Perhaps the city will mandate that they all be heart shaped in honor of Valentine’s Day. More government intrusion into our lives…… when is enough enough?